TO THE roll call of unlikely heroes we must now add the name of Russia's diminutive replacement scrum-half Alexander Yanyushkin. Not only did he score the infant rugby nation's first World Cup try after seeing a small patch of light in what must have looked like a mountain range of blue Italian jerseys, he saved the ruling International Rugby Board from an especially deep embarrassment. Yanyushkin's scuffling score may not have come within the length of Gorky Street to the one his countryman and namesake, Prince Alexander Sergeevich Obolensky ran in against the All Blacks on behalf of England 75 years ago but it had a certain nobility all of its own. It meant, above all else, that in the end the Azzurri were merely ahead by 53 points to 17, a score-line which but for the brave little man's intervention might have come uncomfortably close to the century mark. That would have been in the worst possible taste and timing in view of the fact that the IRB had just announced its decision to forgive Samoan centre Eliota Fuimaono-Sapolu for his angry charge that its policy of giving the big teams twice as much rest time as their "second tier" opponents was a form of slavery. Fuimaono-Sapolu unfortunately went a bit further than that, suggesting it was in fact rugby's version of the Holocaust. However, if he was quick to retract a grotesque overstatement yesterday, it was not at the cost of his basic argument that it was outrageous to expect the likes of Samoa, Georgia and Russia to face front-line rugby nations Wales, England and Italy, conquerors of France in this year's Six Nations action, who had enjoyed three or four days of extra recuperation from bruising opening games. The challenge this represented for a team like Russia, still learning the basic techniques of scrummaging and with Italy's superstar Sergio Parisse in especially luminous form, became progressively huge - right up to the moment Yanyushkin remembered the battle cry of the oppressed that it is better to die on your feet than live on your knees. Yanyushkin's thrust for the line provided the inspiration for two more Russian tries and was the difference between a bruising, draining 80 minutes and an exquisitely painful humiliation. 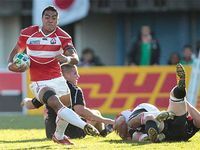 In forgiving Fuimaono-Sapolu his outburst, the IRB naturally drew an official veil over the substance of his complaint. This, we are asked to understand, came out of an ignorance of one of the basic realities of the evolving tournament of a still emerging professional game. Scheduling insists, we are told, that the needs of television and their advertisers are given first priority. Having a daily diet of live play requires a certain sacrifice - one that it has been decided must be borne by those who are least able to make it. This is the IRB's idea of a little kneeling at the altar of professionalism but the fact is that, in its seventh incarnation, this World Cup continues to surrender potentially its most potent form of advertising. This is the possibility of extraordinary, inspiring performance from those areas which will ultimately dictate the breadth and depth of a world game. The Samoans, 49-12 winners against Namibia in their opening game, claim bitterly that with the same rest and preparation time as the Welsh they would have done a lot better than the bonus point which came with the 17-10 defeat. The Georgians could hardly make such a claim after going down 41-10, but it is still true that they performed with a haunting brilliance of spirit and effort until exhaustion overcame them in the second half. When Georgia ran at England, when they induced a stream of penalties and went into the half-time break just seven points adrift, they had given the seventh World Cup a whiff of something splendid that might well have stretched out and coloured the game beyond the Caucasus. England, pushed against the wall, would almost certainly, you have to believe, have found a way out of their crisis even against a team who had been required to return to the action after just a four-day break from their bruising game with Scotland - as opposed to the eight days granted their conquerors. 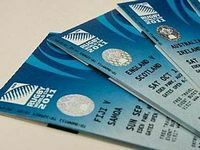 The IRB makes the point that rugby in places like Georgia and Samoa and Russia is well served by the development seed money made possible by the TV revenue created by a World Cup. It says that one day there will be a level field and equable arrangements for rest and preparation - a day when an Alexander Yanyushkin and his team-mates perhaps do not have to face quite such loaded odds. In the meantime, maybe the best hope is that someone at the business end of rugby grasps that what Yanyushkin pulled off yesterday was something that in the long run might prove to be more valuable than any amount of television gold.